Fatigue or low energy is a very common condition. It can range from awakening in the morning with a chronic tired feeling to a severe physical and psychological depression characterized by a total lack of pleasure or sense of fulfillment (anhedonia). Fatigue is a warning: it is one of the earliest signs that some thing in our lives, physical or emotional, is not right. No baby is born bored. And if anyone should be bored, it's a baby! All it has to do is to eat, excrete and sleep. But babies are full of energy, excitement and vitality; they're full of life. When a child complains that he or she is tired all the time, or bored, we know that something is very wrong. What happens to our natural curiosity, sense of wondrous adven ture and boundless energy as we age? Why have so many adults lost (or rather, lost touch with) life's excitement? What happened to life's sparkle? When adults exhibit chronic tiredness or fatigue, we don't get nearly as concerned as when a child does-and that's a big mistake. Life should be filled with energy, no matter what a person's age-the biographies of many notable people teach us that well into their seventies, eighties and even nineties they are robust-full of lust for life. There can be many causes of chronic fatigue. They can be organic conditions such as cancer, cardiovascular disorders and endocrine disorders; or emotional stress such as depression, anxiety or trauma. Chronic fatigue can be due to sleep deprivation; the adverse effects of prescribed, over-the-counter or illegal drugs; or an unhealthy lifestyle that doesn't permit you to "catch up" with your self. Others feel that chronic fatigue may be a nutritional condition that can be corrected with improved diet. A common cause of fatigue is an unbalanced spinal column. How? A simple analogy: If you were carrying a bowling ball, how much more difficult would it be to carry it at a distance from your body than at your side? Your head weighs about as much as a bowling ball; if your head is off-center, "carrying" it can exhaust you! Also, your 24 movable vertebrae, sacrum, hips and pelvis also need proper alignment in order to make efficient use of your energy. A modest unbalance (for example, a "short" leg) could translate into a considerable amount of wasted energy as the hours, days, weeks and months add up. When chiropractors correct a mechanical distortion in your body with a chiropractic spinal adjustment, nerve system energy is normalized. In effect, chiropractic care heals a broken bridge between your "physical body" and your "energy body" so that they may communicate better with one another and restore harmony to your "body-mind." In the same way that classical physics was superseded by Einstein's physics when Newton's laws could no longer explain newly discovered phenomena, medical science is beginning to accept new worlds of healing. In my own practice, several cancer patients have recovered completely after being pronounced incurable and given only a few months to live. I didn't think they were miracles; 1 thought they were proof that the mind can go deep enough to change the very patterns that design the body. It can wipe mistakes off the blueprint, so to speak, and destroy any disease--cancer, diabetes, coronary heart disease-that has disturbed the design. There is abundant energy within you all the time. Unfortunately, it can get blocked, unbalanced and congested. Today... many physicians are reexamining and applying therapeutic techniques that were previously discarded as "unscientific" by academic medicine. The use of foods, herbs, meditation, and acupuncture [represents) only a few examples... 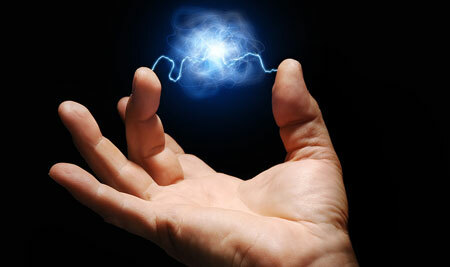 The chemistry of life has been revealed to be based upon the underlying forces of electrical and magnetism. our bodies and brains generate electromagnetic fields within us and around us.... Current popular healing practices use an invisible common source: the body's innate electrical systems. All your body systems run on energy and, when properly work ing, give you an abundance of the energy and life with which you are naturally endowed. There is abundant energy within you all the time. Unfortunately, it can get blocked, unbalanced and congested. If you are fatigued, bored, tired, depressed or lacking enthusiasm, you should investigate the natural health approach of chiropractic.